CBS News has an article, HealthCare.gov pricing feature can be off the mark, which is a good explanation of the price increases I wrote about in the post, The Affordable Care Act ”” The Fix Is In. The rates on Healthcare.gov’s “window shopping” page and the downloadable spreadsheet were using the rates for a 40 year old couple and that price is dramatically different than the rate for a 59 year old couple. So if we look up the 2nd lowest silver plan for 2014 on www.ehealthinsurance.com we find that the monthly cost for a 40 year old couple is $632 compared to the September 24th estimate of $515. This is a more “palatable” 23% increase. I still do not understand how some people are reporting that the rates are going down in Ohio. 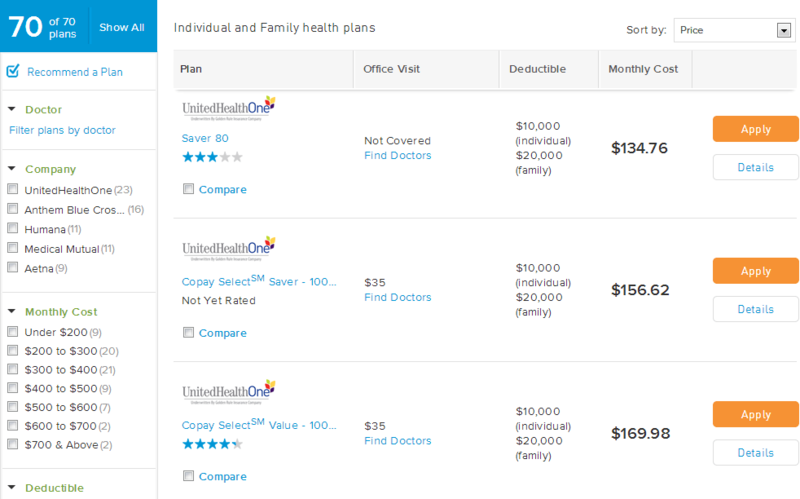 Here are some of the 2013 plans for a 40 year old couple available at www.ehealthinsurance.com. For those who are curious the 2nd lowest silver plan monthly cost for a 50 year old couple is $884 in 2014 and $1,288 for a 59 year old couple. For a person who is paying $391 a month for a plan that whose actuarial value is almost a silver plan, I am still trying to deal with a 229% price increase.